Do you want to ignite a health and wellbeing culture change in your workplace? Our workshops will inspire your staff; their patients, colleagues and friends to adopt healthy lifestyle changes. Using our expertise in behaviour change, we support individuals to initiate lifestyle changes that benefit their physical health and general wellbeing. Seize your opportunity to promote your organisation's health and wellness, as well as guide and support those you interact with to make healthy lifestyle changes. Workshops typically last 1.5 – 2 hours and are suitable for groups up to a size of 20. They are highly interactive with opportunities to discuss and learn from other participants. Free of charge to Dorset healthcare professionals, local authorities and voluntary organisations; they are a valuable addition to employee CPD and wellbeing. We also offer training to employers and workforces in Dorset. 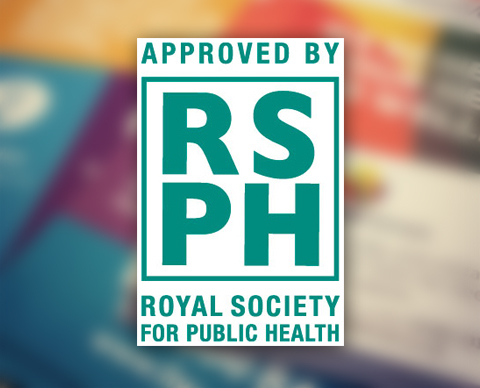 Our four workshops are approved by the Royal Society for Public Health. RSPH has long recognised the importance of education to have a powerful influence on the health and wellbeing of others. The RSPH accreditation confirms the quality of the training suite in meeting its objective. LiveWell Dorset training strengthens the confidence of staff and volunteers, providing knowledge and skills to better execute their important work. Submit an enquiry about our training using the following form. We'll be in touch to discuss a training strategy for your context. Which workshops are you interested in? How many people would you like to attend? When and where would you like the workshop to take place? The tailored approach LiveWell Dorset uses to come up with solutions to the things that are stopping us achieving our goals, is based upon work done by University College London developing the COM-B model of behaviour change. In this model, all behaviour is influenced by understanding a person’s capability to change, their opportunity to change and their motivation to change. By understanding which of these is the biggest barrier to change, we can tailor support accordingly. This model of behaviour change is at the centre of the support we offer, online and in person. Login or register, to favourite activities that you want to try. Is this the first time that you've used our services, or have you already registered with us? To allow us to best serve you, please confirm whether you're new to LiveWell Dorset, or if you've spoken to us before and may have an existing account. Welcome back, it's good to hear from you again! To speak to one of our dedicated team and get the help you require please request a call back. All call backs from this service are free of charge to both landlines and mobile. Do you provide your consent to share your information with the LiveWell Dorset team – part of Public Health Dorset ? When you register with LiveWell Dorset, we ask you some questions about you and your health (how much you smoke, how active you are, how much you drink and how much you weigh). We store that information and use it to shape our service offer to you – such as the advice we give or the extra services we connect you to. The only people who will see this information will be those involved in the delivery of the service and management of the data. If you would like to use extra services (such as slimming clubs and pharmacies) we have to share this information with them. For us to be able to put you in touch with these services, we must have your consent to share that information with the service (we’ll ask for that later, when if you sign up for extra services). You're happy for your personal information to be shared with LiveWell Dorset. You acknowledge that you can withdraw your consent at any time by informing LiveWell Dorset. You understand that if you do not give consent or withdraw consent then it could be difficult for us to connect you some of the services we offer. If you require any more information to help you make your choice then please contact the LiveWell Dorset team on 0800 840 1628. All telephone conversations at LiveWell Dorset are recorded for quality and training purposes, and stored whilst you are registered as active within the service. Unfortunately we need your permission to store your personal information to help us to assess the best support we could provide or signpost you to. If at any stage you change your mind and are happy to provide your personal information please come back and visit us again.